As a company full of tech fanatics, Claritas Solutions has a workforce which is both passionate and knowledgeable when it comes to computing. With this in mind, its experts have taken the time to create a list of ten of the most impressive supercomputers on planet earth. Speaking with individuals who work in cybersecurity, hosting, software design and development, the company has selected ten machines both from the past and modern day which have been celebrated as achievements in supercomputing. The Earth Simulator Supercomputer stays true to its name. Developed by the Japanese government initiative “Earth Simulator Project”, it was a highly parallel supercomputer system designed for running global climate models to evaluate the effects of global warming, and problems in solid earth geophysics. The Earth simulator was the fastest supercomputer in the world from 2002 - 2004. Its performance on the LINPACK benchmark was 35.86 teraflops*, which was almost five times faster than the previous fastest supercomputer, ASCI White. The Roadrunner was a supercomputer built by IBM for the Los Alamos National Laboratory in New Mexico, USA. The computer was designed to be a massive 1.7 petaflops* machine and on May 25 2008, Roadrunner became the world’s first TOP500 LINPACK sustained 1.0 petaflops system. The Cray-1 was developed by a team led by the legendary Seymour Cray in 1975. It was a freon-cooled 64-bit system running at 80 MHz with 8 megabytes of RAM. The machine, using vector instructions, could yield a peak performance of 250 megaflops*. Over 100 Cray-1’s were sold, making it one of the most successful supercomputers in history. The Titan has a staggering theoretical peak of 27 petaflops and is currently the fourth fastest supercomputer on the planet however it is due to be eclipsed by the Summit at Oak Ridge National Laboratory in 2019. Created by NRCPC, the Sunway TaihuLight is currently third on the TOP500 list of supercomputers with a LINPACK benchmark rating of 93 petaflops. The computer is currently centred at the National Supercomputing Centre in Wuxi. The Sunway TaihuLight was the world's fastest supercomputer for two years, from June 2016 to June 2018, according to the TOP500 lists. The record was surpassed in June 2018 by IBM's Summit. The TaihuLight made breakthroughs in the supercomputing industry by combining the control unit with the calculation unit, developed entirely by the National Research Center of Parallel Computer Engineering & Technology (NRCPC). The TaihuLight has been used over the years for multiple different scientific calculation tasks including aerospace research, weather forecasts and geographical simulations. Used by the National Security Agency (NSA) back in 1991 and remaining operational until 1997, the “Frostburg” computer was originally delivered with 256 processing nodes but was later upgraded in 1993 to a (then) massive 512 processing nodes and 2TB of RAM. The CM-5 had a peak performance of 65.5 gigaflops* and the futuristic looking lights on its side were not just for aesthetic reasons. The light panels would show processing node usage and were also used for diagnostics purposes. Built by the University of Manchester, the SpiNNaker machine is made up of one million processors capable of 200 trillion actions per second – meaning it can model more biological neurons in real time than any other machine ever built. The SpiNNaker stands apart from any other supercomputer built before it, by mimicking the parallel communication architecture of the human brain, meaning instead of sending large amounts of data from point A to B, it sends small amounts of information to different destinations simultaneously. Short for Spiking Neural Network Architecture, the SpiNNaker is the first real attempt to creating a real model of a working human brain, with 1 million cores, it’s still a long shot from the 1 billion biological neurons in real time that the human brain provides. Even still, the machine will be able to provide unparalleled insight into how the brain works. 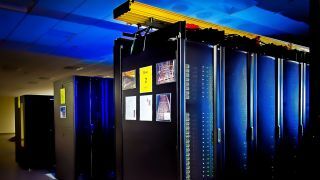 The Summit, as of June 2018, is the most powerful supercomputer on the planet. It makes it to number three on this list simply due to its unprecedented power - the fastest in the world at 200 exaflops*. Not only is it the most powerful, it is also the fifth most energy efficient supercomputer around.